Hopefully, your parents instilled a solid dental routine in your lifestyle from the time you were young. But over the years, many patients tend to fall off track and only brush their teeth twice a day—if that—and completely forget about flossing! Those habits aren’t good dental hygiene habits, let alone trying to reach your optimal oral health. In order to get your smile back up to its optimal level of health, follow these tips from your Sachse dentist. You and your smile will be thanking Sachse Family Dentistry in the long run! Sachse Family Dentistry is ready to do their part to provide excellent dental care every time a walk into our office. We just ask that you do your part of maintaining your healthy smile at home, too. According to the Oral Health Foundation, one in four adults admit that they don’t brush twice a day. Astonishingly, one in ten people admits that they forget to brush their teeth regularly. Basically, your mouth is breeding ground for bacteria—not all is bad bacteria, but it’s still very important to brush your teeth. The point of brushing your teeth in the morning is to remove the bacteria that has been festering overnight in your mouth. It’s also important to remove the bacteria and food that has built up around your mouth at the end of the day. Flossing isn’t typically something that most patients look forward to. It takes time and effort to remove plaque between each and every tooth. Nevertheless, flossing is a very important part of preventive dental care! Be sure to floss between each tooth, even in hard to reach places to avoid gum disease in the future. 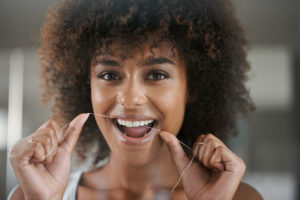 Flossing simply once a day can also reduce the time your dentist must scrape hardened tartar from between your teeth during your dental appointment. Maintaining a healthy, balanced diet doesn’t just benefit your body, it helps keep your mouth teeth and gums healthy too. Even with the most rigorous, consistent home dental hygiene routines, your teeth will still begin to discolor. This is natural, but the foods and drinks you decide to consume can play a part too. Dark colored drinks like wine, coffee, and black tea attack the enamel of your teeth and can permanently stain if it seeps into the dentin of your teeth. The best option for your teeth is water! To keep your jaws strong and durable, it is important that you are feeding your body the right vitamins and nutrients to keep it healthy. You should incorporate foods that are rich in calcium, vitamin D, Vitamin C, and raw crunchy veggies to exercise your jaw with consistent chewing. Keep Your Routine Dental Appointments! When was your last dental visit? Visiting your dentist in Sachse every six months (at least) is one of the most important parts of maintaining good oral health. Dr. Travis Rottman can examine your mouth for both minor and major dental issues during a thorough examination. This way, you know where your health is standing, what to avoid, and how to improve it. After all that is said and done, you will also receive a professional cleaning! Why wouldn’t you show up to your semiannual appointment? Call today to schedule the next available time slot.